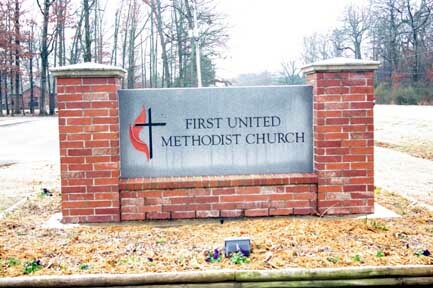 The First United Methodist Church was formally established in De Witt in 1868 under the ministry of Reverend Thomas H. Ware, who had been converted, united with the church, licensed to preach, joined the conference and took the De Witt appointment all in the same year. 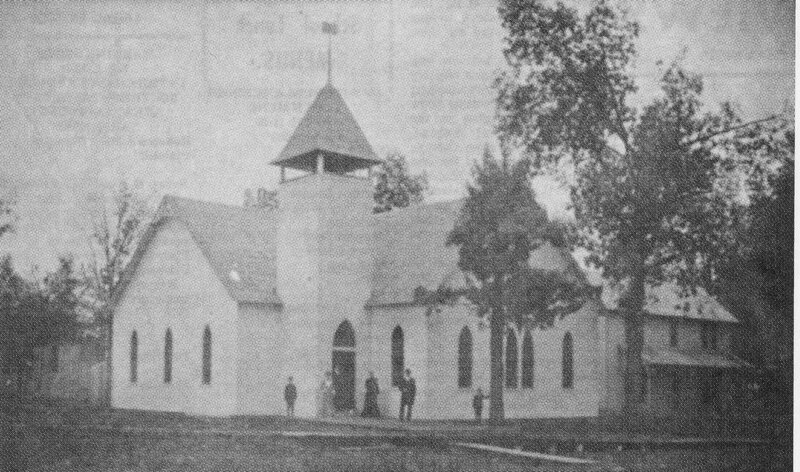 Church services were first held in the Courthouse, but in late August of 1870 the congregation began to build its first church building. Completed in 1871, the one-room wooden structure was located one block north of the Court Square on the corner of North Main and Gibson streets. This first building was torn down and usable parts were transfered to the southwest corner of West Cross and Jefferson streets to the new and larger wooden church building being constructed. This new church served the Methodist congregation from 1902 to 1921 when it was destroyed by fire. 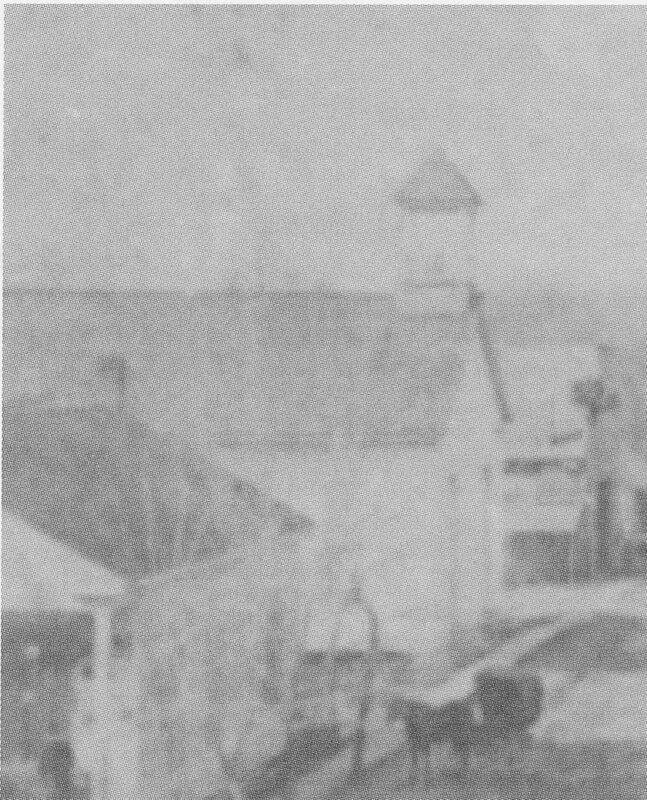 Several days following the Christmas program of 1921, the Christmas tree was removed to the lot just south of the church building and set afire. A strong wind blew the burning tree up against the church building and set it on fire. De Witt had no fire protection at the time, and very little but the pews was saved. The parsonage, a large two-story home which stood just west of the church, was also destroyed by the fire. Soon plans were inaugurated for a new church building; meanwhile services were conducted in the local school. 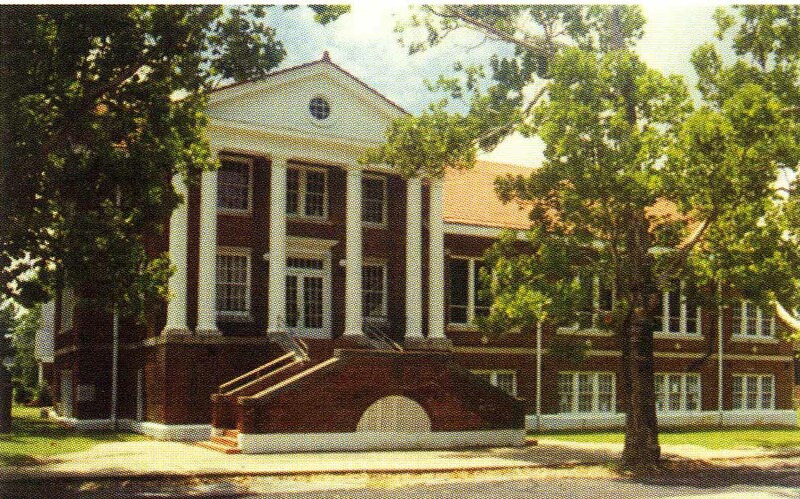 The stately new brick structure was completed in 1923. In 1925, a frame parsonage was built on the corner of Second and Jackson streets. Funds to pay for this parsonage were raised in part by ladies of the Missionary Society through dinners, bazaars, food sales, rummage sales, selling vanilla and floor polish, having progressive teas and the pennies game. The pennies game involved ladies of the church collecting the pennies and bringing them to the progressive teas. Mrs. Mayme Burnett recalled that at one of the meetings of the Missionary Society word was sent from the local banks to release the pennies because they were completely out! The planting of the sycamore trees in front of the church was instigated and supervised by W.F. Schallhorn, Sr. The first service in the new church was led by Reverend S.R. Twitty. In later years a concrete floor was installed in the church basement, and Educational Building and a new brick parsonage were constructed. In September of 1992, this church building received the honor of being placed on The National Register of Historic Places, the official inventory of significant historic sites in the USA. However, time had taken its toll on the building. Structural damage from shifting ground caused dangerous cracking and separation of walls leaving the building unsafe in several areas. The church membership voted to go forward with plans for construction of a new church. 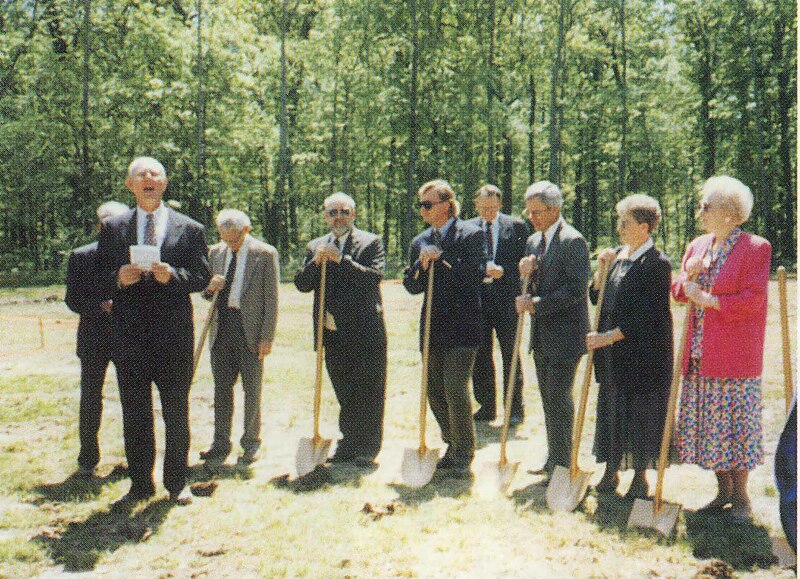 On April 9, 1994, ground-breaking ceremonies were held at the site of the new church to be located on Grandview Drive on the western city limits of De Witt. Funds have been continuously raised over many years including chicken noodle dinners by the ladies of the UMW, bake sales and wrapping paper sales by the your of UMY, donations by members, matching funds from the Godfrey Thomas Foundation, and memorials in honor or memory of loved ones. Initial construction completed the Fellowship Hall which included Sunday School rooms, staff offices, a large kitchen and the exterior only of only of the sanctuary. Chairs were placed and a temporary altar was constructed in the Fellowship Hall to enable the congregation to meet while raising funds for the completion of the rest of the building. Much of the work was done voluntarily by church members. 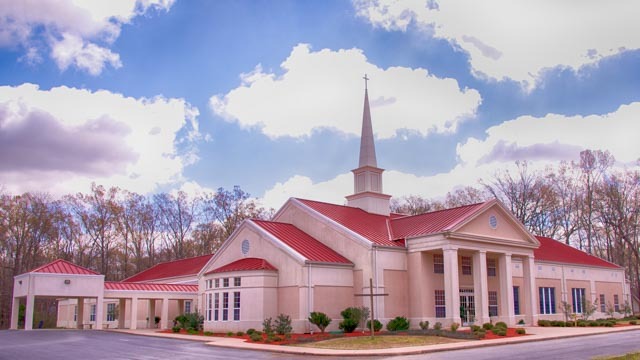 In 2000, the final service was held in the building that had served the Methodist congregation since 1923, and members of the church traveled by caravan to the partially completed new building on Grandview Drive. Symbols of faith including the pulpit Bible and the altar table were carried by young and old members of the church, and the new building became the new church home of The De Witt First United Methodist Church. In 2002, a construction company was hired to finish the work on the new church including the sanctuary, parlor, chapel and choir room. 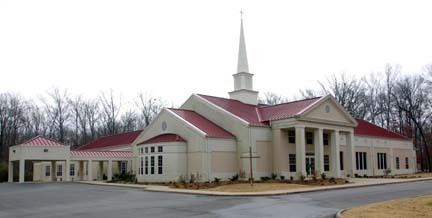 With construction complete in 2003, members of the congregation and the Building Committee followed through with the equipping and decorating of the church in preparation for its long-awaited use for worship services. In 2007, plans were completed for a 2,316 square foot parsonage and construction was begun on the property just south of the church. In 1958, the Women's Society of Christian Service commissioned Jacoby Art Glass Company of St. Louis, Missouri to prepare eighteen windows of Blenko glass. Memorial funds of the WSCS combined with gifts by members of the congregation paid the original amount of $7,830.00 These priceless treasures were removed from the Cross and Jefferson streets location, restored and reinstalled in the new church with contributions by many of the same families who purchased the windows originally. 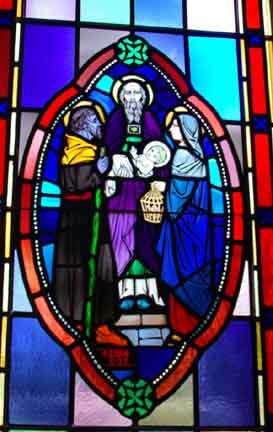 Each beautiful window is titled and together they tell the story of the birth of Jesus, His life, crucifixion and ascension. 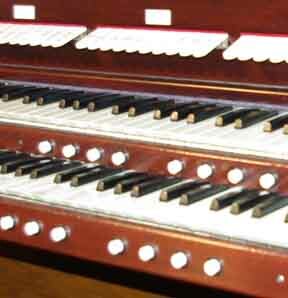 The magnificent pipe organ in the sanctuary is a source of great pride for the congregation. The organ was built in 1949 by the Kilgen Organ Company of St. Louis, Missouri, one of the world's oldest pipe organ makers, at a cost of $11,250. 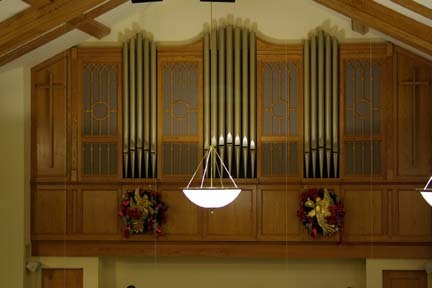 The tremendous value and significance of the organ to the church resulted in the decision to restore and move it to the new church on Grandview Drive. 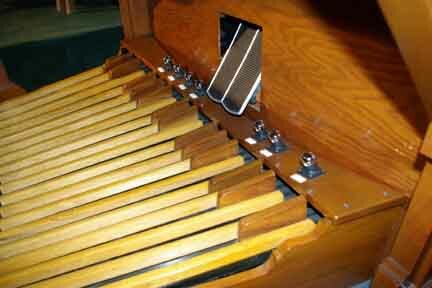 The organ was disassembled, restored and reinstalled by Greg Koziel of Koziel Pipe Organ Services of Memphis, Tennessee. New components added during the restoration process enhanced the performance of the 11 rank pipe organ now valued at $160,000. The worship service during our First Sunday Celebration is the first opportunity the congregation has had to hear this wonderful organ being played.